Where did Salvador Dali grow up? 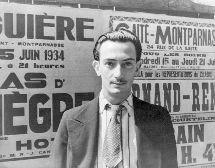 Salvador Dali was born in Figueres, Spain on May 11, 1904. His father was a lawyer and very strict, but his mother was kinder and encouraged Salvador's love for art. Growing up he enjoyed drawing and playing football. He often got into trouble for daydreaming in school. He had a sister named Ana Maria who would often act as a model for his paintings. Salvador began drawing and painting while he was still young. He painted outdoor scenes such as sailboats and houses. He also painted portraits. Even as a teenager he experimented with modern painting styles such as Impressionism. When he turned seventeen he moved to Madrid, Spain to study at the Academy of Fine Arts. 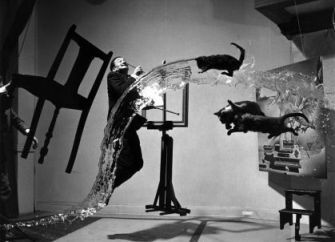 Dali lived a wild life while at the academy. He grew his hair and had long sideburns. He hung out with a radical group of artists and got into trouble often. When he was close to graduation he was expelled for causing problems with the teachers. Not long after that, he was imprisoned for a short time for supposedly opposing the dictatorship of Spain. Salvador continued to experiment and study different kinds of art. He explored classic art, Cubism, Dadaism, and other avant-garde painters. Eventually he became interested in Surrealism through artists such as Rene Magritte and Joan Miro. From this point he would concentrate much of his work on Surrealism and become one of the preeminent artists of the Surrealist movement. Surrealism began as a cultural movement. It was started by a French poet named Andre Breton in 1924. The word "surrealism" means "above realism". Surrealists believed that the subconscious mind, such as dreams and random thoughts, held the secret to truth. The movement had an impact on film, poetry, music, and art. Surrealist paintings are often a mixture of strange objects (melting clocks, weird blobs) and perfectly normal looking objects that are out of place (A lobster on a telephone). Surrealistic paintings can be shocking, interesting, beautiful, or just plain weird. In 1931 Salvador Dali painted what would become his most famous painting and perhaps the most famous painting of the Surrealist movement. It is titled The Persistence of Memory. The scene is a normal looking desert landscape, but it is covered with melting watches. Go here to see a picture of The Persistence of Memory. Dali's art began to gain international fame. He married his longtime love Gala and they moved to the United States in 1940. The Spanish Civil War took place in the late 1930's and then World War II in the early 1940's. Dali painted pictures depicting the horrors of war. After the war, Dali began to paint about religion. He had grown up in a Catholic family. One of his most famous paintings during this time was Christ of St. John of the Cross which he painted in 1951. In the picture the cross floats high in the sky. You look down from an extreme angle and see a lake with a boat and some fishermen. Dali is the most famous of the Surrealist artists. His ability to shock and entertain made his paintings popular to many people. Many of today's artists have been inspired by Dali's work. His full name is Salvador Domingo Felipe Jacinto Dalí i Domènech. All of the watches in The Persistence of Memory tell different times. He was famous for his long curly mustache. He wrote an autobiography called The Secret Life of Salvador Dali. Some of the stories in the book are true, but some are just made up. Dali admired scientist Albert Einstein and was especially interested in his Theory of Relativity. He once worked on a film with movie director Alfred Hitchcock. You can see examples of Dali's work at Salvador Dali Online.